This look at the past and present of the great artist, Jose Guadalupe Posada, provides great information about the artist and his influence. Posada mastered the craft of lithography while he was young and by 1895 he was highly skilled at engraving in metal and etching in zinc. At this time, Posada was the only one working in these mediums; it was actually Posada who introduced these techniques to Mexico. This article would be a good companion to MoMA’s website, which includes images. The text may be a bit advanced for some readers, but it could be read before class by the teacher and then presented to the students in an easier to digest form. Quotes from the article could also be picked out and used as part of a display or included on an information sheet. * Day of the Dead: Experience the Tradition. Software. Apple App Store. Vers. 1.0. University of Notre Dame, n.d. Web. 25 Nov. 2012. This app and its contents was developed by a team of students from the University of Notre Dame and Indiana University South Bend, and directed through the Julian Samora Library at the Institute for Latino Studies, in cooperation with the Snite Museum of Art. Included in the app are sights, sounds, and interviews about the Day of the Dead. There are four main pages, which include an overview of the celebration, the significance of ofrendas, music and songs to serenade and honor the dead, and foods consumed during the Day of the Dead. Included in the section on food is an easy to follow recipe to make atole, a traditional Mexican drink similar to hot chocolate. This recipe could be passed out to students so they can make it at home. There are several interactive features in the app and a few videos. The video on the sounds of the Day of the Dead are especially interesting. It is a look at traditional Mexican music and the role music plays in celebrating the dead. * “Day of the Dead Altar Artist Interview: Mizael Sanchez.” YouTube. Peabody Museum of Archeology & Ethnography, 19 Oct. 2010. Web. 26 Nov. 2012. Harvard’s Peabody Museum has an ongoing exhibition of a Day of the Dead altar, or ofrenda, located in the Encounters with the Americas gallery. The altar features items from the Alice P. Melvin collection of Mexican folk art and was designed by Mexican artist Mizael Sanchez. In this interview with the artist, Sanchez takes you through the permanent altar at the Peabody and explains the significance of each item. He explains the importance of his color choices and some of the meaning behind Mexican designs. Sanchez also points out the tradition of creating rhymes or poems to pole fun at the dead and attaching them to the calaveras. This practice is meant to emphasize that everyone meets again in the afterlife. This video would be best paired with some of the other resources on ofrendas. * “Day of the Dead and Papel Picado.” YouTube. Peabody Museum of Archeology & Ethnography, 26 Oct. 2012. Web. 26 Nov. 2012. In this video, Harvard Divinity professor David Carrasco explains the significance of papel picado, or cut paper, in Day of the Dead celebrations. Carrasco touches on the history of the craft, including what tools were once used, then launches into the modern practice of creating papel picado. Carrasco mentions Jose Guadalupe Posada and gives a brief history of his life as an artist and tells how Posada’s lithographies became the inspiration for many papel picado representations. Posada’s inspirations are described by Carrasco, and his influence on modern day artistic representations of Day of the Dead is explained. This video is a great explanation and introduction to the art of papel picado and would be a wonderful companion to the resources on Jose Guadalupe Posada and Marcelino Bautista Sifuentes. * Day of the Dead in Janitzio. By Roger Cudney, Alfonso Olvera, May Herz, and Isabel Abdala. Inside Mexico, 2004. DVD. “Day of the Dead in Janitzio features one of the most magnificent rituals of the rich Mexican culture. This time the celebration takes place in Janitzio, a magical little island in the State of Michoacan, perhaps the single most famous place for witnessing the Day of the Dead commemoration. The people of Janitzio, the famous fishermen with butterfly nets, have conserved the authenticity of their customs, their rituals, their dances and their way of dressing. Through this program you will see their vibrant dances, their typical food being prepared, rituals by the fishermen that take place in the lake, and of course the mystic and spiritual moment in the tombs in which the living pay their respects to their dead loved ones as a grand celebration of life! * “Dia De Los Muertos, Origin of the Day of the Dead.” YouTube. Village Memorial, 22 Mar. 2011. Web. 26 Nov. 2012. <>. Covered within this educational video are the following: Religious Developments, Attitudes on Death, Development of the Holiday, and Celebration of the Holiday. The information contained within this video is very detailed. It covers the evolution of the celebration, from the Aztecs to the modern day celebrations of Day of the Dead. Especially interesting was the discussion of the attitude towards death. Included was an explanation of Jose-Guadalupe Posada’s most famous work, La Calavera Catrina, which shows a laughing, well-dressed woman skeleton. Her laughter is emblematic of the Mexican perception of death, and La Catrina’s elegant clothing is a reminder that death is the great equalizer. The speaker in the video is a bit dry and it may be difficult to hold the interest of some children. Still, this video would be a valuable resource to introduce the Day of the Dead. This fifteen-minute video contains a lot of information and could be broken up into smaller segments to introduce specific aspects of the Day of the Dead followed by a lesson or activity. * Arquette, Kerry, Andrea Zocchi, and Jerry Vigil. 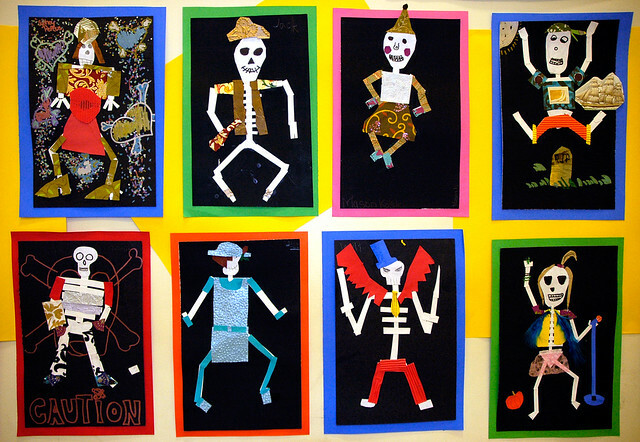 Day of the Dead Crafts: More than 24 Projects That Celebrate Dia De Los Muertos. Hoboken: Wiley, 2008. Print. “Celebrated on November 1 and 2, Day of the Dead honors the memory of departed souls, welcoming them back to celebrate the best of life. Families decorate grave sites with marigolds and set up stunning altars. Streets flutter with paper banners. Store windows glisten with sugar skulls. Skeleton figures grin rakishly from every corner. Day of the Dead Crafts is filled with dozens of terrific projects that allow you to participate in the excitement of the holiday while expressing your own creativity. You’ll enjoy showcasing these unique, fun, and meaningful projects throughout the year. Dead Man’s Bread, or Pan de Muerto, is a deliciously sweet egg bread that can be flavored with orange zest, anise, or cinnamon. It is traditionally decorated with bone shaped bread pieces and dusted with sugar. Pan de Muerto is meant to symbolize the soil and is eaten at the gravesite or near the altar of the person being celebrated. Pan de Muerto can be baked following this recipe by the teacher prior to class and brought in to share with the students. A printout of the recipe can also be shared with the students following the lesson so they may bake it at home with their families. Many versions of this recipe can be found online or in other books, but this book could also function as an opener to a larger discussion about Frida Kahlo. Pan de Muerto may also be purchased pre-baked from local bakeries or grocery stores. * “Make Sugar Skulls: Step-by-step Day of the Dead Sugar Skull Making Instructions with Photos, Ingredients & Tips.” Mexican Sugar Skull. Reign Trading Co, 2012. Web. 15 Nov. 2012. Sugar Skulls, or calaveras, are a prominent item found in Day of the Dead celebrations. They are decorated with brightly colored paint or icing and usually bear the name of the person they are meant to honor. The sugar skulls are placed on the alters or grave sties of loved ones as a way of honoring them. For those who already own sugar skull molds or have found a more economical means of obtaining them, mexicansugarskull.com has put together step-by-step instructions on how to create the sugar recipe. Included in this tutorial are videos, tips for making large batches, and links to read more about sugar skull making. * McAnde, Thaneeya. “How to Build an Altar for the Day of the Dead.” Celebrate Day of the Dead. Thaneeya LLC, 2012. Web. 15 Nov. 2012. Celebrate-day-of-the-dead.com is a great resource for information on what the Day of the Dead is and how to celebrate it. Their page on altars stresses the importance of the tradition to Mexican culture. The page includes an image of an altar and tells how it was constructed. Each piece’s significance is explained. As the explanation for construction is explained, the site also provides tips on how to create your own altar — from choosing the space to including proper offerings, or ofrendas. This site is a great introduction to the practice of creating altars for lost loved ones. * “Sugar Art Kits for Families, Classrooms, & Parties.” Mexican Sugar Skull. Reign Trading Co, 2012. Web. 15 Nov. 2012. This kit will allow you and your class to make your own sugar skulls that can be decorated and personalized by the students. This craft will take some time but can be done in the classroom spread out over two days. The skulls can be made one day and decorated the next day once they have had time to dry. The sugar skulls can also be made ahead of time by instructors and brought to school for decoration. This kit is designed for children grades 4 through 12. Designed for 80 students, this kit will make up to 160 tangerine-sized sugar skulls and four batches of Royal Icing. * “Sugar Skull Piñatas with Kathy Cano-Murillo – Re:create Ep. 5.” YouTube. YouTube, 25 Oct. 2012. Web. 20 Nov. 2012. These easy-to-make piñatas are made by repurposing paper lanterns and covering them with magazine strips. When finished, they will resemble large sugar skulls that can be filled with goodies. This craft can easily be made in class, perhaps in small groups, with the finished projects used as classroom decorations. Once the skull piñatas are constructed, kids will have fun gluing on the colorful eyes, mouth, and flowers and using paints to make their piñatas colorful. This project will engage children and get them to think creatively. * Ponsford, Cathy. Day of the Dead Me. Software. Apple App Store. Vers. 1.0.2. Simply Sweet Apps, 19 Nov. 2012. Web. 25 Nov. 2012. This fun and free app can be downloaded to a cell phone or tablet computer. The app allows the user to take a picture of themselves, or use an existing picture, and decorate the image with traditional festival makeup and flowers. Celebrators of Day of the Dead often dress up in costume and makeup inspired by calaveras. The app allows you to personalize photos of yourself or loved ones. You have the option to choose from a variety of colors and designs. The finished pictures could serve as inspiration for a real-life face painting session in class. * Andrade, Mary J. Day of the Dead, a Passion for Life: Dia de los Muertos, Pasión por la Vida. San Jose: La Oferta Publishing, 2007. Print. “Mexico is a country with a mixed culture of pre-Hispanic and Hispanic heritages and finds satisfaction in honoring the dead. * Anderson, Geri. “Through the Lens: Dia de los Muertos (Day of the Dead).” MexConnect. 31 Oct. 2007. Web 15 Nov. 2012. This picture gallery shows Day of the Dead celebrations in Oaxaca, Mexico. This resource will give children a glimpse into the celebration of Day of the Dead in a different country. Any students who are native of Mexico could be invited to share their experience. All students would benefit from seeing these real-life celebrations by Oaxacan’s, who take part in the festival wholeheartedly. The site contains three photo albums: Cemeteries, Street Scenes, and Just for Fun. Images can be culled by instructors to be used as examples of how different people celebrate their dead. * “Dancing Calavera.” Smithsonian Latino Virtual Museum. Walt Disney Company, 2012. Web. 15 Nov. 2012. This interactive webpage allows you to choose from a variety of Mexican musical styles and a variety of colors for a dancing calaca, or skeleton. Once you choose a song you can use your computer’s mouse to make the calaca “dance.” This site is fun and entertaining. It is also a great way to show children how other cultures view death. Mexican culture celebrates the dead and skeletons do not have the same scary and menacing connotations as in the United States. Children will begin to understand the celebratory feelings surrounding the Day of the Dead and they will have fun making their skeletons dance to different songs. * “Master Paper Cutter, Marcelino Bautista Sifuentes”. My Papel Picado. N.p, n.d. Web. 15 Nov. 2012. Sifuentos is an artist who creates beautiful cut paper. The Mexican art of papel picado is prominent in Day of the Dead celebrations. Today most papel picado is created using machinery. The art of hand-cutting the thin paper into intricate designs using specialized tools is a dying art. Sifuentes became interested in the art form later in life but has since become a master of the craft. He has been commissioned to create works for several museums and he often gives demonstrations and workshops. Examples found on his website can be viewed in classrooms or printed as decoration. They can be used as inspiration for students to create their own papel picado. * “Mexico’s Day of the Dead Resource Page.” MexConnect. N.p., 10 May 2011. Web. 20 Nov. 2012. This resource page is a collection of stories that can be read aloud or to yourself. The site contains descriptive stories of Day of the Dead as well as personal experiences with the celebration, and original short stories. The descriptive stories are wonderful because they provide rich details about the customs and traditions. Some of the personal accounts would be great read-alouds because they paint a clear picture of the celebration and why it is important to so many people. The short stories would also make great read-alouds and could be used as a jumping off point for students to write their own original tales. * Museo Nacional De Muerte. Universidad Autonoma De Aguascalientes, 2008. Web. 26 Nov. 2012. Located in Aguascalientes, the home of artist Jose Guadalupe Posada, the Museo Nacional de la Muerte, or the Museum of Death, houses over 2,000 pieces of death related art from pre-hispanic artifacts to modern paintings and sculptures. The website does have the option to view the site in English, however, the translations are not always exact or easy to understand. The site offers a virtual tour of the museum, which allows you to view the art on the walls. As described on the website, the collection aims to “show death not as a physical process, but how it was interpreted and manifested throughout Mexican history.” This collection of art shows how a different culture celebrates death. Luckily, so much of the collection is available to view online. * “Smithsonian Latino Center Day of the Dead: Dia De La Muertos.” Smithsonian Latino Center Day of the Dead: Dia De La Muertos, 2012. Web. 15 Nov. 2012. <. The Smithsonian Latino Center has created an interactive website for kids with separate pages for the history of Day of the Dead, the symbolism behind key items, and the customs and beliefs surrounding the holiday. Perhaps the most exciting feature of the website is the “Build Your Own Altar,” where you may add flowers, candles, photos, and more to an interactive altar. You can customize it any way you would like and then have the option to print. Descriptions of the item’s significance are included so that children may learn their symbolism while they build their own ofrenda. Other great features of the site include a section for educators with links to lesson plans and ideas, as well as a glossary of important terms. * McAnde, Thaneeya. Sugar Skull: Coloring Pages. PDF File. Sugar Skull Coloring Pages: A Printable E-book of 21 Sugar Skull Designs to Color. Art-is-fun.com, 2012. Web. 20 Nov. 2012. This downloadable contains 21 pages of sugar skulls, including 35 detailed skulls and 14 blank skull outlines. Invite children to express themselves by choosing the colors they want to use to decorate the beautifully designed skulls, or by decorating one of the blank skulls themselves. * Austin Flower Market. N.p, n.d. Web. 26 Nov. 2012. Marigolds are an important symbol in Day of the Dead celebrations. Often referred to as “the flower of the dead,” marigolds are placed on Day of the Dead alters and gravesides during the festival. The marigolds can also be fashioned into arches and used as a larger decoration. Their scent is said to attract the dead and show them the way back home. In Spanish they are known as cempazuchitl, cempasuchil or zempasuchitl. Purchasing some marigolds in advance would be a wonderful addition to a Day of the Dead unit in the classroom. They can be used to decorate a classroom alter or students can string them together to create garlands. They can be purchased from the Austin Flower Market which is located within King Florist. Marigolds may also be found at other flowers shops or grocery stores. Edited for formatting by UTLiteracy admin. Feb 2013.